The combustion of coal to generate energy is an inherently dirty process. The combustion product is primarily carbon dioxide, one of the main greenhouse gases. High-temperature combustion also produces NO„ both from nitrogen contained within the coal and from atmospheric nitrogen. If the coal contains sulphur (and all natural coals contain some sulphur), this emerges as sulphur dioxide, a potent chemical that is converted into acid in the atmosphere. Incombustible mineral material in the coal is left as ash and slag which must be disposed of harmlessly. And some mineral and particular material escapes with the flue gases into the atmosphere; this can contain trace metals such as mercury which are potentially harmful. With such a catalogue of unwanted by-products, it is not surprising that coal combustion has attracted criticism. And as areas that have been laid waste by uncontrolled burning of coal - such as parts of northern India, or areas in eastern Germany testify - such criticism is fully justified. Modern developments have sought to make coal combustion as environmentally benign as possible. To this end, strategies have evolved to control all the pollutants generated in a coal-fired power plant. These strategies can be extremely effective and while some are costly, others are cheap to implement. Cleaning coal prior to combustion can significantly reduce the levels of sulphur emissions from a power plant as well as reducing the amount of ash and slag produced. This can have a beneficial effect on plant performance and maintenance schedules. It has been estimated that boiler availability improves by 1% for every 1% reduction in ash content. The main approach to physical coal cleaning has been outlined above. One disadvantage of coal cleaning is that it leads to a loss or between 2% and 15% of the coal with the coal waste. However it is possible to burn this coal waste in a fluidised-bed combustion (FBC) plant (see p. 33). NOx are generated by a reaction between oxygen and nitrogen contained in air during combustion. This NOx production is strongly affected by two factors, the temperature at which the combustion takes place and the amount of oxygen available during combustion. Controlling these parameters provides a way of controlling the quantity of NOx generated. This is achieved most simply using a low NOX burner. A low NOX burner is a burner which has been designed to create an initial combustion region for the pulverised-coal particles where the proportion of oxygen is kept low. When this happens, most of the available oxygen is captured as carbon dioxide during the coal combustion process, leaving little to react with nitrogen. 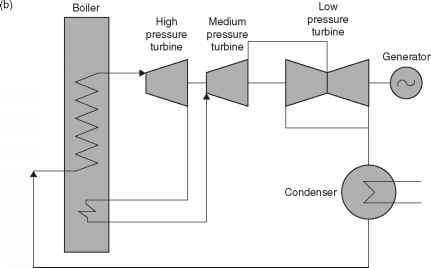 To achieve this end, some of the air needed to burn the coal completely is prevented from entering the initial combustion region with the coal; instead it is delayed briefly, being admitted to this primary combustion region after some of the combustion has been completed. This staged combustion procedure (as it is commonly known) can reduce the level of NOX produced by 30-55%. The initial combustion zone is normally the hottest region in the furnace. As the combustion gases leave this zone they start to cool. At this stage, further air can be admitted (if combustion of the pulverised coal is still incomplete) to allow the combustion of the fuel to be completed, but at a lower temperature where the production of NOX is reduced. The air admitted at this stage in the furnace is called 'over-fire-air'. When used in conjunction with a low NOx burner, the use of over-fire-air can lead to a reduction in NOx levels of 40-60%. A third strategy which can reduce the NOx level even further is called reburning. This simply means that more coal, or natural gas, is introduced into the combustion gases after they have left the combustion zone. The effect is to remove some of the oxides of nitrogen that have been formed. Overall reductions of up to 70% can be achieved. Low NOx burners, over-fire-air and reburning are all strategies that can be applied to existing coal-fired power plants as well as being incorporated into new plants. There is no strategy similar to low NOX burners that can be used to control the emission of sulphur dioxide. If sulphur is present in coal it will be converted into sulphur dioxide during combustion. The only recourse it to capture the sulphur, either before the coal is burnt using a coal-cleaning process, or after combustion using some chemical reagent inside the power plant. There are many chemicals that are potentially capable of capturing sulphur dioxide from the flue gases of a power station but the cheapest to use are lime and limestone. Both are calcium compounds which will react with sulphur dioxide to produce calcium sulphate. If the latter can be made in a pure enough form it can be sold into the building industry for use in wallboards. The cheapest method of capturing sulphur dioxide is to inject one of these sorbent materials into the flue gas stream as it exists the furnace. The reaction then takes place in the hot gas stream and the resultant particles of calcium sulphate, and of excess sorbent, are captured in a filter downstream of the injection point. Depending on the point of injection of the sorbent, this method of sulphur removal can capture between 30% and 90% of the sulphur in the flue gas stream. The cheapest, and least effective method (30-60% capture efficiency) is to inject the sorbent directly above the furnace. Injection later in the flue gas stream is more expensive but can remove up to 90% of the sulphur. Sorbent injection into a flue gas stream is the cheapest way of capturing sulphur but it is not the most efficient. The best-established method of removing most of the sulphur from the flue gas of a power plant is with a flue gas desulphurisation (FGD) unit, also called a wet scrubber. The FGD unit comprises a specially constructed chamber through which the flue gas passes. A slurry of water containing 10% lime or limestone is sprayed into the flue gas where it reacts, capturing the sulphur dioxide. The slurry containing both gypsum and unreacted lime or limestone is then collected at the bottom of the chamber and recycled. Typical wet scrubbing systems can capture up to 97% of the sulphur within the flue gas. With special additives, this can be raised to 99% in some cases. Wet scrubbers can easily be fitted to existing power plants, provided the space is available. Wet scrubbing technology is technically complex. It has been likened to a chemical plant operating within a power station. For this reason it requires skilled staff to operate. Nevertheless is provides the best-proven method for removing up to 99% of the sulphur from a coal-fired power plant's flue gas stream.